Just a Farmer, Plain and Simple - JP loves LIFE! I posted the poem “I’m just a farmer, plain and simple” by Bobby Collier a little while ago as a tribute to a friend’s grandpa. The blog post has amazed me. It resonates with a lot of people who read my blog and it’s drawn others in thanks to web searches, etc. The idea of “just a farmer” is something that a word person like myself gives a lot of thought to. It isn’t the farmer part that gives me such pause — I know a lot of farmers and think it is an incredible profession. These are the men and women who provide the food, feed, fiber and fuel that power our nation and certainly have powered my professional life. So I give the farmer part a decent amount of thought. It is really the just in “just a farmer” that catches my attention. I hear it a lot. “I’m just a simple farmer.” Or maybe “I just grow….” When the words are spoken by a farmer, they invoke a humility that is frequently missing. I mean how many times have you heard someone say “I’m just a politician” or “I’m just a plastic surgeon?” I know, I have heard similar things from other professions and usually they are from people who’s jobs are taken for granted. Teaching is one. Humility is one thing that I have always appreciated in the farmers I talk to — it is probably one of the characteristics that makes farmers most accessible to me and others who were not raised in agriculture. But building the perception among others that your profession is somehow less than another is unacceptable. (And yes, I would also suggest that in anyway holding your profession up as superior to others is unacceptable as well.) And in the case of farming, when we have less than two percent of the U.S. population engaged in agriculture, I would suggest it is damaging to our industry’s best interests. 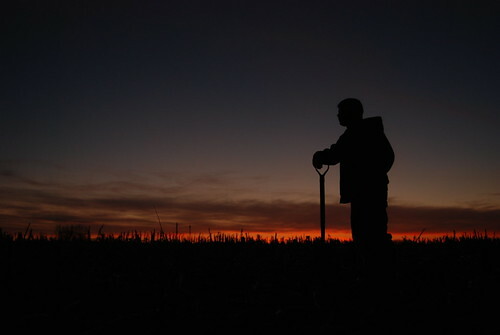 Nobody knows a field better than the farmer who’s family has called that land home. There is a depth of knowledge about environmental science, mechanics, chemistry, engineering and more that makes farming highly technical. Business acumen is required — you need to know people (ones you hire, work for, supply products to, etc. ), there is accounting work to be done, records to be kept about your farm practices, etc. Vision based on where we’ve been and where we are going. And this is the one that leaves me interested because farmers need a long-term view to help us get where we are going with demands for certain crops, etc. So what am I saying? I don’t want to suggest farmers become boastful but I would say that the sense of pride farmers feel from producing the food that we all eat is reason to hold your heads high and choose words more carefully at times. The reality is everyone needs a reminder about the fantastic work you do, so if someone asks you about your farm, hold your head up and tell your story. No need to wait for the invite either, tell your story to the folks you interact with frequently — the folks at church, in your kid’s school, at a civic club or wherever. If someone else is claiming to tell your story or the story of American farmers as if there is only one, take a little time and personally tell your story — especially if you have another perspective as the diversity of our ranks is incredible and should be highlighted. Most of the farmers I know wouldn’t think to tell someone else how to farm. But telling your story is about sharing your perspective and it becomes , but we need to be telling our stories just the same. We aren’t defending against the others, if people are farming, there is no reason to be adversarial — we need all hands on deck to feed our families, communities and the world. It’s just a word I know…. and it represented the way my dad felt about the work he did too, but by showing that humility, I think some people who don’t know better think it refers to importance. And since that’s the case, I’ve never met a woman or man who was just a farmer! I’ll have to tackle that plain and simple thing another day! Or I may let it rest. « Will my iPad put the smackdown on my netbook? Our citizens benefit in so many more ways than they realize from our wonderful agricultural production machine- its been said we are the most efficient in the world. Agriculture is the root of a strong society. We contribute food, fiber, fuel, flowers, and so very much more. Almost 99% of our population can choose a career or job because they do not have to raise the food, fiber for their own family. About 150 years ago, almost everyone had to raise food for their own family. Our country’s power and influence in the world are greatly ipacted because for hundreds of years we have exported agricultural products. We get so many other products from agriculture too – cosmetics, renewable plastics, wood, etc….Farmers are the original environmentalists as they recyled manure, used minimal inputs, adopted no till practices and continue to emphasize conservation of our land and water resources. We are so blessed and the average citizen has no idea. Janice you know that I left the farm after college. Got my first job off the farm as an assistant store manager. Became store manager not long after. Then moved on the last three years to manage another location. Not quite six years away from the farm. That was a job. I had a decent title and had 35-40 working for me, but it was just a job. I left because I didn’t care to do it anymore. Looking back I probably always new I’d be back on the farm. I love when people ask what I do for a living because they never expect to hear “I’m a farmer.” It’s a good ice breaker. I don’t have a job anymore because what I do defines me as a person now in my opinion. Love this! When people ask me what I do for a living, I usually start with something like “I get to work with farmers” or “I work in agriculture” those usually are accompanied by a smile. Its not because I’m not proud of doing PR & communications, just that more of my drive comes elsewhere a lot of the time. That shouldn’t surprise anyone knowing I’m an extrovert… I get energy from working with awesome people… so who better to work with than farmers I ask? THAT”S IMPOSSIBLE TO FIND!! !